To increase your traffic from Google, a Search Engine Optimisation (SEO) consultant would want hefty fees every month. However, much of what they do is neither secret nor difficult. In this four-session course, you’ll learn how to carry out basic SEO tasks yourself, using freely-available tools. You’ll learn: how to find out what people are searching for; decide on search query targets; how to do basic site and page optimisation; what other activities will support your efforts, and how to test and measure what’s working and what isn’t. SEO requires both the understanding of theory and the practical application of what is learnt. 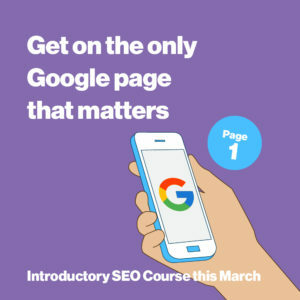 This course takes a step-by-step, logical approach through the tasks that make up SEO, following each section of theory with immediate practical application to your own website. There will be a maximum of eight places on this training to allow for individual attention. You will need time between the sessions to work on your own website and master the skills taught. Fully updated for 2019, the course concentrates on the things you can action yourself that will make a difference. We’ll avoid things that are beyond the capabilities of most business owners, or ‘busy work’ that involves lots of effort with negligible rewards. Despite the growth of social media and paid advertising, ranking in Google search remains an essential part of internet marketing. Although the basis of SEO remains unchanged, Google’s recent innovations have added a new layer of complexity, especially in the assessment of site and page quality. The course is based on up-to-date SEO and how it is best practised in 2019 and beyond. This course is suitable for business owners, and others with professional responsibility for getting results from a website. The learning applies whether you need SEO for WordPress, Shopify, Magento, Squarespace, Wix, Blogger, or a custom website. All types of business can benefit from greater visibility within search: B2C, B2B, e-commerce, services, local businesses. As well as cost, one other advantage of managing SEO in-house is that you know at all times what is being done in the name of the businesses.